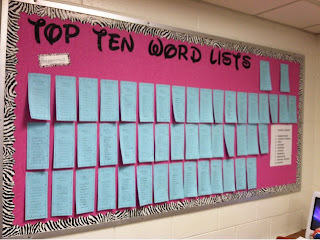 Pinkadots Elementary : Top Ten Word List! 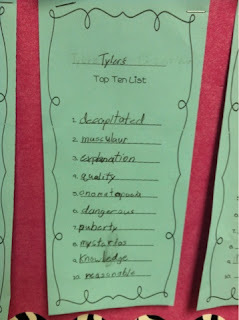 I LOVE words too! When I was little, I memorized all of the 2 letter words in the Scrabble Dictionary! 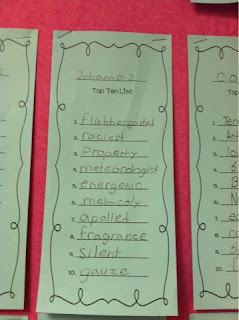 =) I love to use Donovan's Word Jar with my kiddos. Thank you for this fun *freebie*. Hi Heather, Thanks for stopping by! I'm so happy I'm not the only word geek! That's awesome you memorized the words as a little kid, you must be a pro at the game "Words With Friends!" Hope you enjoy the word list with your students. I never heard of Donovan's Word Jar, but just looked it up. It looks adorable. I think it will be perfect as a read aloud too. Thanks for the suggestion! I am going over to check out your blog now.